Strategy offers a framework for aligning your sales development model with your specific market and buyer’s journey. Specialization presents stories of new thinking. You’ll learn about segmenting your prospect universe, specializing roles, and how it all comes together. Recruiting offers a roadmap for hiring with urgency. Tactics, compensation, and a bullet-proof hiring process are presented in great detail. Retention goes deep on the stuff that never seems to get enough consideration: engaging, developing, and motivating people. Execution switches gears and presents examples and tactics for onboarding, crafting buyer-based messaging, and designing effective outreach cadence. And, finally, Leadership, gives actionable advice on what it takes to lead sales development today. There’s a lot to learn about quota setting, measuring what matters, and acceleration technologies, so those are covered in depth. This book defines how sales development teams should operate. 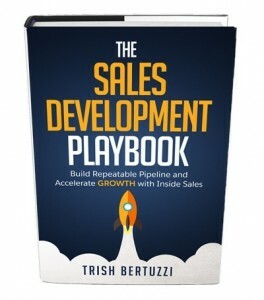 If you are a Sales Development leader in a company, this book will outline not only what your role is but how to build your team to scale into a growing revenue machine.